Waukegan is home to an industrial port and regional airport which invite numerous jobs in the manufacturing and transportation industries. With industry comes risks to the safety of workers and the Waukegan workers compensation attorneys of Rosenfeld Injury Lawyers LLC specialize in maximizing the value of workers’ compensation claims and recovering damages from negligent employers. We work hard to ensure that our clients can focus on their rehabilitation without fear of falling into deep financial debt. If you have been injured in a workplace accident, it is important to seek the advice of an experienced work comp attorney to make sure that you are receiving the respect and benefits that you are entitled to. If you or a family member was injured on the job and are in need of a Waukegan, IL workers compensation lawyer, contact Rosenfeld Injury Lawyers LLC today for a free consultation. With a port that supports roughly 100 cargo ships per year off of Lake Michigan and an airport with a customs office, Waukegan was founded in the prime location for the development of industry. Its port is home to Gold Bond Building Products, LaFarge Corp. and St Mary’s Cement and houses nearly 100,000 tons of gypsum and 14 cement silos. It is also home to one of Uline’s largest distribution centers, which employs over 1,200 workers. Its access to the Union Pacific/North Line also makes it an important part of the rail network by which millions of tons of freight is moved through the Midwest every year. The transportation industry is responsible for about 31% of all workplace accident related deaths even though only 4% of the injuries reported in the state occur in transportation related jobs. The use of commercials trucks and machinery in this industry makes it far more likely for injuries to be fatal or life altering and employers in the transportation industry often try to cut corners when it comes to safety. Establishing the exact cause of an accident is the most important step in determining the value of your case. You are entitled to benefits regardless of whether you can prove your employer or a third party was responsible, but the ability to prove negligence is useful when your workers’ compensation benefits are not sufficient to cover the financial losses you suffer during your physical recovery. Some of the most common causes of accidents our Waukegan workplace injury lawyers have responded to include the following. Fatigue and overwork. Workers in the transportation industry are notoriously overworked and their employers often encourage them to violate laws that dictate how long they may be on the job without rest. Contact with machinery or mechanical equipment. About 25% of the injuries reported in the private sector are the result of an employee’s contact with large machinery or moving equipment. Equipment malfunctions or defects. When poor equipment design or a defective machine causes an injury, the injured worker may be able to file a claim against the manufacturer of the defective product. Overexertion. Many injuries result from improper lifting mechanics or pushing the body too far when moving heavy objects. 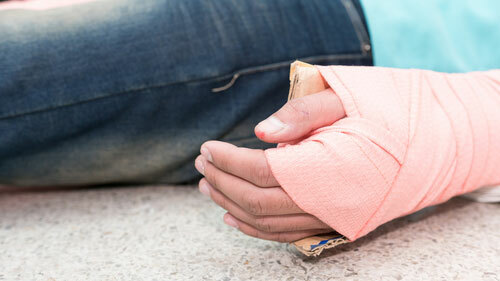 These injuries are common in the warehousing and logistics industries, especially among workers who manually load and unload trucks and railcars. Fall events. About 19% of all workplace injuries are the result of falls and it comes as no surprise that 16% of fatalities result from slip, trip and fall events. Your employer is required to insure its employees in the event they are injured. Most people are unaware of the fact that their claim is handled through an insurance company and the resistance they may receive is not as likely to come from their employer. Insurance companies are notorious for finding loopholes that allow them to avoid paying claims. Some will even resort to dirty tactics or illegal measures to avoid paying your claim. They only get away with this because the average worker is unaware of his or her rights following an accident. You have the following rights whenever filing any workers’ compensation claim. You may see any doctor that you see fit for the treatment of your injuries. Your employer or employer’s insurance company may not dictate to you where you may receive your treatment from and you are entitled to seek opinions from specialists that are qualified to treat your specific type of injury. You may recover the entire cost of your medical treatment, even if you cannot prove that your employer was at fault for your injury. If you have been permanently disabled, you may recover additional compensation for your loss of income and opportunity. While you are sidelined from work, you are entitled to collect 67% of your salary until you are able to return to work. It can be extremely frustrating and discouraging to attempt to file your claim by yourself and this is why 86% of injured workers in Illinois seek legal representation prior to filing their claims. Rosenfeld Injury Lawyers LLC is an award-winning firm that focuses on multiple aspects of your recovery. The primary goal we have for every client is for them to be able to recover from their injuries as quickly as possible or to be able to adapt to their new lifestyles if they’ve been permanently disabled. We have access to a network of the finest medical experts and will ensure that you have access to the treatment and therapy that you need. While you focus on your physical recovery, we will work hard to build your case and evaluate all of the avenues available to secure damages on your behalf. We will do whatever it takes to ensure that your medical costs do not cripple you financially and that you are able to meet all of your financial obligations throughout your rehabilitation. Our commitment to the wellbeing of our clients has made us one of the most trusted personal injury law firms in the state and we would be happy to review your case during a free consultation at a location of your own choosing. Your consultation comes with no risk or obligation and our Waukegan workers compensation attorneys will never accept a fee unless we have been able to recover compensation on your behalf.